A Race of Brains and Brawns ~ Philippine Freebies, Promos, Contests and MORE! A good game requires participants to use their brains as much as they would use their brawns. Take your pick on contest the you want to pursue on November 20, 2010. Will it be The Amazing Race Asia promotional race at SM North Edsa? 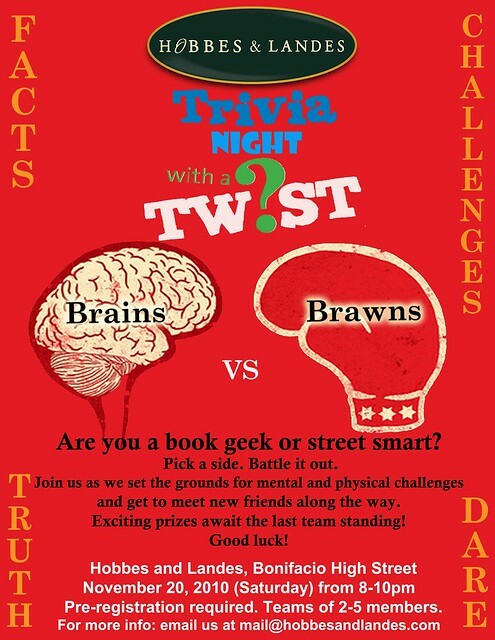 Or would you like to play a trivia competition with a twist by Hobbes and Landes? If you choose the The Amazing Race Asia promotional race, get a partner to form a team of 2 and register online. The winning team will take home $1,000. But if you choose to play Hobbes and Landes Brains VS Brawns, form a team of 2 to 5 members and email to register. The last team standing will take home pries from Hobbes and Landes. Fill-up your contact details, upload a picture and send.